Malala was targeted by the Taliban and severely wounded by a gunshot when returning home on her school bus in Pakistan’s Swat Valley. The then 15-year-old (she turned 18 in July 2015) was singled out, along with her father, for advocating for girls’ education, and the attack on her sparked an outcry from supporters around the world. She miraculously survived and is now a leading campaigner for girls’ education globally as co-founder of the Malala Fund and in 2014, became the youngest-ever Nobel Peace Prize Laureate. Acclaimed documentary filmmaker Davis Guggenheim (An Inconvenient Truth, Waiting for Superman) and producers Walter Parkes (Catch Me If You Can, The Slap) and Laurie MacDonald (The Kite Runner, Flight) shows us how Malala, her father Zia and her family are committed to fighting for education for all girls worldwide. The film gives us an inside glimpse into this extraordinary young girl’s life – from her close relationship with her father who inspired her love for education, to her impassioned speeches at the UN, to her everyday life with her parents and brothers. £1 from every HE NAMED ME MALALA DVD sold will be donated to The Malala Fund, whose goal is to enable girls to complete 12 years of safe, quality education so that they can achieve their potential and be positive change-makers in their families and communities. I am very happy to promote her story on this blog. What was it like having director Davis Guggenheim enter your life to make this film? 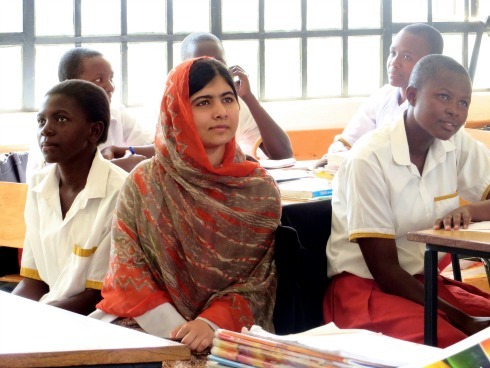 Malala: In the first meeting we were very confused about how it was going to work, what he would ask, whether he would find some actors to play our roles, and how was he going to tell our past story? Then, to begin with, he had an interview with us and he brought no camera. He just brought a microphone and we talked and talked. We developed good communication and a way of understanding each other and I realised that I was saying things that I hadn’t said before. Davis has this talent to help you discover your inner self and to help you discover what is in your heart. He did that very well from the very first interview and that’s really what motivated my father and me to continue this journey and to let Davis into this journey of our life, which is to fight for education and for girls’ rights to go to school. He has filmed that over the last two years — my whole journey, my life at home and my life on the trips where I try to build awareness for girls’ rights in Jordan, Nigeria and Kenya. The movie has become the voice of my life journey over the past two years. Can you convey the emotions you felt when you saw the film for the first time? What was really great about the film when I saw it for the first time was the animation part, with such artistic creativity combining in my story. I found it very exciting and I enjoyed looking back into my past, at the life of my father when he was growing up, the life of my mother and how she faced difficulties and how she stopped going to school. Then, to look at my own life and how I was growing up and how close I was to school; school was my home. Then to see the whole family talking and delivering our story was exciting. What was not so good was hearing my brothers talk against me [laughs]! Davis had the right to choose what he wanted to put in the film but if it were up to me I’d have cut those things out [laughs]! The movie was wonderful and I really enjoyed it. I wish that we will have another movie, He Named Me Malala 2, and then I will talk against my brothers [laughs]! Overall, I am very grateful to everyone who has worked on this film, helping to support the idea that every child deserves education. This movie is very important to my family. Have you always been so fearless and calm, or were you worried at certain points when you were living in Pakistan? I think it is part of human nature to be scared and to feel fear. When I was in Swat Valley there were times when I was scared. I was scared to go to school because of the fear that someone could throw acid on my face or that the terrorists could flog me for going against what they wanted. There were those times. But what kept me going was courage, courage that came to me because of the way my father inspired me, speaking out for women’s rights and girls’ education. Seeing in my community in the Swat Valley that the terrorists were bombing schools, I knew that there would be no peace and that things wouldn’t change if I remained silent. I felt a responsibility to speak out and to say something and that gave me courage. That’s why I have continued with it. Right now, I am very optimistic. I do ask questions before making any decisions but I am optimistic about the future. I think things will change. How important is this film for the Muslim world? Being a Muslim family standing up for education and fighting for peace and women’s rights, this movie clearly shows that Islam is a religion of peace and brotherhood. After seeing the film, people will see how this Muslim family stood up for peace and for education. And, hopefully, it’ll be able to reach every house, in the East and the West, and it will be able to bring the changes that we want to see, not only in bringing education but also showing the importance of peace and tolerance. Do you hope to return to Swat Valley one day? I am hoping that we will be able to go Pakistan very soon and I am very excited about that. I miss my country, having been away for more than three years. It is very difficult. We came to the UK not by our own choice but through circumstances that forced us to come here. It is hard to live in a situation that is not your own choice. But I hope that after I finish my studies I will work in Pakistan. That has been my dream for years, to help my country and to see every child in my country get a good education. This is where the campaign started. I saw terrorism and I saw girls being denied the right to education. The journey started in Pakistan. With terrorism, I think world leaders need to come together and take the threat very seriously because people are suffering. Millions of people have become refugees. I saw that on my trip to the Lebanon and Jordan on my 18th birthday. I saw innocent children living in camps, being away from their homes, and it is so hard for them. Some of them have been away for three or four years. It is not easy to live in this situation when you have no hope for home or for school. If world leaders don’t focus on this war, then more and more children will become refugees. How do you cope with all the attention you receive? It’s a very good question. Right now, it feels like I have two very different lives. One as a girl at home, fighting with my brothers, going to school and living like a normal girl. I have to do homework and exams. I recently did my GCSE exams. And then also I am another girl who speaks out for education. It feels like two different lives but the reality is that it is just one person doing this. I am trying my best every day to connect these two people together as part of my life. What impact has winning the 2014 Nobel Peace Prize had upon your life? Winning the Prize is such a precious award and I was not expecting it at all. It was such a surprise to win that at the age of 17, when I was still a child. I felt very honoured as a child receiving the award for standing up for children’s rights and education, receiving the award along with Kailash Satyarthi, who has done so much for children’s rights. It gave me strength and more courage to continue the fight. More than 66 million girls in this world cannot go to school and the Nobel Peace Prize gave me the opportunity to spread this message further across the world and to ask world leaders to focus more on this problem. Whether I won the award or not, I would have continued to focus on this message. It is part of my life. It’s my life mission. Hopefully, I will have finished my school and university education and I will be doing great work in Pakistan, helping children to go to school. I have a strong commitment to my country and I have promised myself that I will help Pakistan to become a better country, that the people will get peace and good quality education. It is a shame to know that there are children who get no schooling and that there are people with no facilities. I believe my country deserves the opportunity to see progress and development. Do you feel as though the attack you suffered was part of a larger plan, part of your destiny even? I started the campaign when I was only about 10 and it was due to the circumstances that I faced. If there were no terrorists in Swat Valley and I could go to school, then I wouldn’t have had to speak out because there would have been no need. I stood up because there was a need. Someone needed to stand up, to bring change, to talk about education. With the incident, I was targeted because I spoke out very openly. Some people were hesitating about saying the word Taliban, but I did not hesitate. I said that if they’re doing these things then why not say they are doing these things. Even if the incident had not happened I would have continued this campaign and my mission. It just happened. I had no idea if the attack was the end of my journey or whether it was a new beginning. It turned out to be a new beginning. I had to choose. I had been targeted and therefore I could stop. Or I could continue. I had seen the worst moment in my life and I chose to continue because any fear I had of being killed was gone. I feel as though no one can stop me. I am very thankful to everyone for their support. That gives me more courage every day. HE NAMED ME MALALA, the intimate portrait of Nobel Peace Prize Laureate Malala Yousafzai, is released on Digital HD™ and DVD on 29th February from Twentieth Century Fox Home Entertainment.